Buíochas le Dia bhí lá álainn grianmhar inné ag rang a ceathair don turas rothaíochta chuig an Dock. Bhí an-suim acu sa tóraíocht taisce timpeall gnáthóg an trá is d'aimsigh siad a lán feamainn, sliogáin, bláthanna fiána is portáin. Rinneamar ealaín gainimh freisin. Buíochas mór le Carol agus Ger don tacaíocht agus na 'cístí' deasa. Féachaigí ar ár ngriangrafanna. Thankfully the sun shone on Thursday (29/5/2014) for the fourth class cycling trip to the Dock. The children were very enthusiastic about their seashore habitat treasure hunt. They found lots of seaweeds, shells, wild flowers and crabs. They also did some very creative beach art. A big thank you to Carol and Ger for their much appreciated support and not forgetting the delicious baking! Look at some of our photos (click here). Comhghairdeas do gach páiste a ghlac páirt i Spóirt na Cathrach 2014. Bhí an-lá againn! Congratulations to all the children that took part in the 2014 Cork City Sports. We had a great day! We would like to say a huge thank you to the parents who organised the Holy Communion Party on Saturday. A huge effort went into it and we, the children and our families really enjoyed it. It made a special day even more special. Bhí an-lá againn an Sathairn seo chaite, an 24ú Bealtaine 2014 ag Céad Comaoineach Rang 2, 2014. Chomhghairdeas mór leis na páistí. Bhí crut na hoibre ar an searmanais ar fad. Léigh, chan agus ghuigh na páistí chomh maith. Bhí an iompar go hiontach mar is gnách agus tá sé thar a bheith éasca a bheith an-bhródúil astu. Bhí siad ullmhaithe go maith ag a múinteoirí Siobhán Ní Núnáin agus Máiréad. Go raibh maith agat mór leis na páistí sa chór. Is dóigh liom go raibh an amhránaíocht agus an canadh do-chreidte. Chuireadh alán obair agus cleachtadh isteach le Múinteoir Alma agus Róisín Ní Shúilleabháin. Ar deireadh go raibh míle míle maith ag coiste na dtuistí agus na tuismitheoirí ó rang 1 agus ranganna eile a chuir féasta ar fáil sa scoil i ndiadh an tsearmanais. Bhí an chomhoibriú go láidir le feiscint agus bhain gach éinne idir páistí, tuistí, seanthuistí, aintíní, uncail, col ceathracha agus gan amhras múinteoirí an -taitneamh as. Bíonn alán obair le déanamh chun féasta mar sin a cur ar fáil agus gabhaim mo mhórbuíchas le gach éinne a bhí pairteach ann. Sos anois go dtí an chéad ocáid eile...! Agus uaidh sin tá sé chomh maith a rá go bhfuil cinneadh déanta go mbeidh Rang 5 AGUS Rang 6 ag dul faoi láimh an Easpaig le chéile an bhliain seo chugainn 2015. D'ofráileadh an socrú sin dúinn agus phléamar ag an gcruinniú Boird Bainistíochta is déanaí é. Is dóigh liom go mbeidh sé go hiontach an dá rang a ullmhú le chéile agus sos bliana a bheith againn ansan. Ciallaíonn sé chomh maith go mbeimíd inár n-aonair don searmanais agus go mbeidh sé trí mhean na Gaeilge. Tá an t-ádh dearg linn go bhfuil sagairt chomh oscailte againn leis an tAthair de Siúin agus go bhfuil Gaeilge ar a chumas aige. We all had a wonderful day last Saturday the 24th May 2014 as we celebrated the First Holy Communion of 2nd class 2014. A big congratulations to the children. Their hard work was very evident throughout the ceremony. They read, sang and prayed very well. As usual our children's behaviour was excellent making it very easy to be very proud of them. They were very well prepared by their teachers Máiréad and Siobhán Ní Núnáin. A very big thank you to the children who sang in the choir (and their parents for bringing them) I thought the singing was incredibly beautiful. 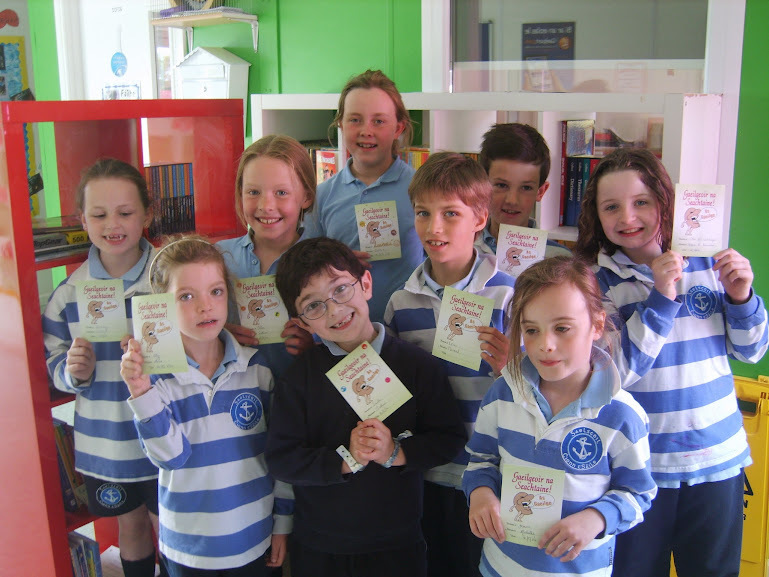 They worked very hard with Múinteoir Alma and Róisín Ní Shúilleabháin. And lastly a huge thank you to the PA and the parents from Rang 1 and other classes who hosted the party in the school after the ceremony. It takes alot of coordination and cooperation to host such an event and everybody -children, parents, grandparents, aunts, uncles, cousins and teachers really enjoyed it. Thanks to all involved! You can take a well earned rest... until the next occasion! Which brings me swiftly onto the next point. It has been decided that Rang 5 AND Rang 6 will go for Confirmation together next year in 2015. This was offered to us to accommodate our Irish language ceremony and to cut down on Bishop Buckley's list of engagements. We discussed it at the last BOM meeting and we decided to go with it. I think it's great to prepare the 2 classes together and have the occasion every second year. This arrangement means we will be able to have our Confirmation ceremony on our own and it will be through Irish. We are very lucky to have an accommodating and open priest such as Fr Young who is so competent as Gaeilge too. Beidh na cártaí 'Bob-a-Job' ag dul amach sna málaí scoile do gach páiste sa scoil inniu (26/05/2014). Is é ata i gceist ná (fundraiser) i gcóir na scoile, díreach mar an gcéanna le cad a dheineamar an bhlian seo chaite. Ó thaobh sábháilteacht de, iarraimid oraibh labhairt leis na páistí chun a bheith cinnte de go dtéann siad go daoine go bhfuil aithne acu orthu amháin. Tógaigí ar ais na foirmeacha agus an t-airgead ar an Aoine an 6ú Meitheamh 2014 le bhur dtola. Beidh duais i gcóir an rang leis an cuid is mó 'bob-a-jobs' ! The 'Bob-a-Job' cards will be going out in the school bags of all the children in the school today (26/05/2014). This is a fund raiser for the school, the same as what we did last year. From a safety point of view, we would ask you to ensure children only approach people they / you know to volunteer for bob-a-job. Please bring back the forms and the money on Friday 6th June 2014. There will be a prize for the class with the most Bob-a-Jobs! Beidh rang a ceathair ag dul ar a dturas rothaíochta ar an Déardaoin seo an 29ú Bealtaine 2014. Beidh rothar sábháilte, clogad agus cóta buí ag teastáil ó gach páiste. Chomh maith leis sin beidh cóta éadrom báistí is lón beag uatha don turas. Bígí ag guí anois i gcomhair dea-aimsire! 4th class will be going on their cycling trip this Thursday the 29th May 2014. 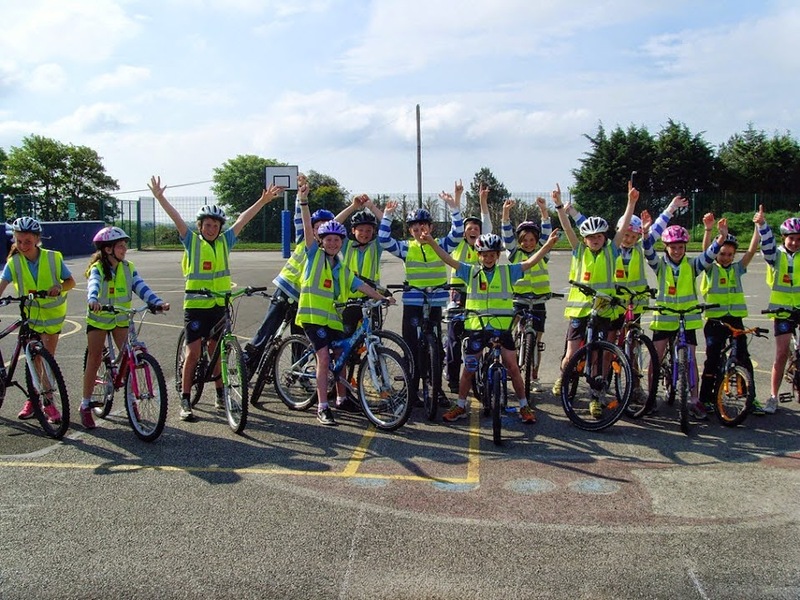 Each child will require a safe bike, a cycling helmet and a high visibility jacket. They will also need a light rainproof coat with a hood and a small lunch for this trip. Fingers crossed now for good weather on the day. Thosaigh traenáil iománaíochta sa scoil inniu (26/05/2014) ! Beidh sé ar siúl gach Luan go deireadh na bliana. Tá gach rang ag glacadh páirt. Hurling training started at school today! (26/05/2014) ! It will be on every Monday until the end of the year. Every class is taking part. Ba chóir go mbeadh éadaí scoile spóirt á chaitheamh ag na páistí gach Luan agus Aoine as seo go deireadh na bliana in ionad ar gach gCéadaoin agus Aoine. The children must wear their sports clothes every Monday and Friday from now until the end of the year instead of on Wednesday and Friday. Tá fir ón stáisiún dóiteán ag teacht chun na scoile ar an gCéadaoin an 28ú Bealtaine 2014 chun caint leis na páistí faoi shábháilteacht tine sa bhaile. Is deis iontach é seo don scoil agus táimid ag súil go mór leis. There are men from the fire station coming to the school on Wednesday 28th May 2014 to talk to the children about fire safety at home. This is a wonderful opportunity for the school and we are really looking forward to it. Meabhrúcháin faoi na socraithe don lae amárach 24/05/2014. Searmanais ag tosnú ag 11.00. Páistí an Chéad Comaoinigh sa séipéal ag 10.30. Páistí an Chóir sa séipéal ag 10.30 ina n-éadaí scoile chomh maith. Beidh fáilte an domhain roimh páistí an chóir ag an bhféasta sa scoil i ndiaidh an searmanais. Gabhaim mo mhórbuíochas leo sa chór mar tuigim go bhfuil an t-uafás oibre curtha isteach acu chun cabhrú leis an scoil. Maith iad! Ag súil go mór leis an lá! 1 codladh eile... ! Just a quick reminder about the arrangements for tomorrow 24/05/20014. ceremony begins at 11.00 sharp. Choir children at the church for 10.30 in their school uniforms. Beidh an blitz rugbaí leaitse ar siúl amárach, 22/05/2014, do Rang 1 agus Rang 2. Tá €2 ag teastáil ó gach pháiste chun cabhrú le costas an bhus. Bíodh éadaí oiriúnacha ar do pháiste agus uachtar gréine, ag braith ar an aimsir. Táimid ag tnúth go mór leis. 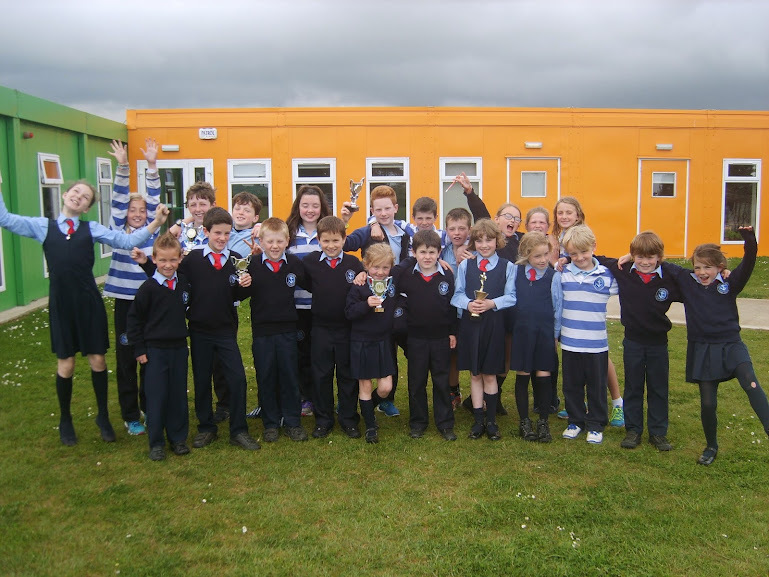 1st and 2nd Class will be takeing part in a tag rugby blitz tomorrow, Thursday 22/05/2014. €2 is needed from each child to help pay for the bus. Please ensure that your child is wearing suitable clothes and sun cream, depending on the weather. Táimíd ag cleachtadh sa tséipéal ar an gCéadaoin an 21/05/2014, agus ar an Aoine an 23/05/2014. Beidh na páistí ó Rang a 1 go dtí Rang a 5 atá ag glacadh páirt sa cór ag cleachtadh sa tséipéal. Le bhur dtola, tabhair do pháiste díreach chuig an séipéal ag a 8.50. Beidh siad ag siúl ar ais timpeall a 11.30, mar sin bí cinnte go bhfuil cóta orthu. Is féidir libh na málaí a thabhirt chuig na scoile roimh ré más mian libh. The school choir are practicing in the church on Wednesday the 21/05/2014 and Friday the 23/05/2014. This practice is only for pupils from 1st to 5th class who are singing with the choir for the communion, including the pupils who are doing their communion. Please bring your child directly to the church both mornings at 8.50. They will walk back to school at around 11.30, so please ensure that they are wearing a coat. If you wish, you could drop their schoolbags into the school beforehand. I hope that you and your family are looking forward to Saturday. We kindly ask you to bear the following in mind. Please make sure your child is at the church by 10:30 am as the ceremony will begin at 11 a.m. promptly. If you could please ask your child to use the toilet before they come to the church so as to avoid unnecessary interruptions during the ceremony. There is however a toilet outside the church if you need it. We ask that you refrain from taking photographs before and during the ceremony. The children will be arranged at the end of mass where a group photo will be taken by the Photographer. The children might leave any accessories e.g. umbrellas, gloves with you until after the ceremony. You are all invited back to the school for tea and coffee where the children will enjoy their well-deserved party. Cur ordú isteach chomh luath agus is féidir. Tá cúpla cinn breise ann má theastaíonn ó dhaoine níos mó ná 2 cheann a cheannach ach díolfar iad dos na céad daoine a lorgaíonn iad. Please send back your order asap. There are a limited number of extra copies if people would like to order extras. These will be sold on a fist come, first served basis. Tá an t-eolas a ghabhann le Spórt na Cathrach, a bheidh ar siúl ar an gCéadaoin, 21-05-2014 seolta abhaile leis na leanaí ina málaí scoile inniu 19-05-2014. Beidh roinnt the Rang a 5 ag glacadh páirt i bhFéile Peile Gael Linn amárach, Dé Máirt an 20ú lá de mhí Bealtaine 2014. Beidh siad ag fágaint an scoil ar a deich a chlog chun dul go dtí an páirc CLG i Mayfield agus beimid ar ais roimh am dul abhaile le cúnamh Dé. Bíodh éide spórt cheart ar gach duine, deochanna agus lón slántúil leis. Chomh maith leis sin an bhféadfadh sibh E2 a thabhairt isteach chun cabhrú le costas an bhus. Some of 5th class will be going to Féile Peile Gael Linn tomorrow, Tuesday the 20th of May 2014. They will be leaving at 10am to go to Mayfield's GAA pitch and will be back before school finishes. Please ensure that everyone brings a healthy lunch, water and the proper gear, boots, gloves, mouthgaurd etc. E2 is needed from everyone as a contribution towards the cost of the bus. Beidh blitz rugbaí leaitse ar siúl ag Rang 1 agus Rang 2 an Déardaoin seo chugainn 22.05. '14 le linn am scoile. Tá praghas €110 ar an mbus. Dá bhrí sin ba cheart do gach pháiste €2 a thabhairt isteach chun íoc as. First and Second Class will have a tag rugby blitz next Thursday 22.05.2014 during school time. The price of the bus is €110 so each child must bring in €2 to help pay for it. Mar is eol daoibh, níor chuaigh an bhlitz peil gaelacha ar aghaidh coicís ó shin. Táimíd ag iarraidh dáta a shocrú i gcomhair Mí an Mheithimh. Muna rachaidh sé ar aghaidh, gheobhaidh na páistí ó Rang a 1-Rang a 3 an €3 ar ais. Beidh níos mó eolas ag teacht go luath. As you know, the 1st -3rd class football blitz was postponed due to the bad weather. We are trying to arrange a new date in June. If it doesn't go ahead in June we will reimburse the €3 to those who have paid.We will hopefully have more information soon. Ba cheart go mbeadh litir faighte agaibh faoin dtráth seo ón HSE faoi na hinsteallaithe ar scoil ar an Déardaoin (15.05.'14). Ná dein dearmad teacht isteach. You should have received a letter from the HSE about the vaccinations taking place at school this Thursday (15.05.2014). Don't forget to come in for this. Chomh maith le sin tá scrúdaithe radhairce acu ar an 26ú, 27ú agus 29ú de Mhí Bhealtaine '14. Ní gá díobh teacht isteach don teist sin áfach. As well as this they have sight tests on the 26th, 27th and 29th of May 2014. You don't have to come in for this test. Beidh daoine ón O.E.C. ag teacht chun na scoile amárach (14/5/2014) chun gníomhaíochtaí lasmuigh a dhéanamh le gach rang. Níl le déanamh ach na héadaí spóirt a chaitheamh amárach agus an t-airgead a thógaint isteach le bhur dtola. Kinsale Outdoor Education staff will be coming to the school tomorrow Wednesday 14th May 2014 to do orienteering and outdoor activities with every class. There is a cost of €2 per child up to and including 2nd Class. There is a cost of €4 per child in 3rd, 4th and 5th Class. The children just need to wear their sports clothes tomorrow and bring in the money also please. Tá blitz iománaíochta R3 agus R4 ar siúl amárach, 13/05/2014. Níl ach foireann amháin le líon páistí áirithe ag imirt. Tá an fhoireann roghnaithe againn. Bíodh 'gear' le haghaidh iománaíocta ag na daoine sin amárach le bhur dtola agus péire stocaí breise mar beidh an féar fliuch. There is a 3rd and 4th class blitz tomorrow, the 13/05/2014. Places on the team are unfortunately limited and the team has been named. Please make sure the players bring in gear tomorrow along with spare socks as the grass will be wet. They will be walking to the pitch, leaving at 9.45 and returning at around 12. Beidh an Chéad Comaoineach ar siúl ar an Sathairn 24ú Bealtaine 2014 ag 11.00 ar maidin. Beidh ar na páistí a bheith ann ag 10.30 ar a dhéanaí. Fé mar is eol daoibh tá an éide scoile le caitheamh ag na buachaillí le bléasar le suathantas na scoile air. Fé mar a dúirt me cheanna tá 4orm sásta an suathantas a fhúáil ar an mbléasar ar €5. Tógann sé cúpla lá/seachtain is dóigh liom. Ma tá deacracht ag daoine an bléasar a bhailiú tá duine des na tuismitheoirí tar éis a rá go mbeidís sásta iad a bhailiú do dhaoine buíochas mór di. Mar sin má tá deacrachtaí agat an bléasar a bhailiú cur glaoch ar Hilda agus cabhróidh sí leat. Beidh leabhrán le ceannach agaibh don gCéad Comaoineach. Tuairim is €4 ar ceann amháin, €7 ar dhá cheann. Tá praghas orthu toisc gur ghá dúinn íoc as an clódóireacht dóibh. Beidh nóta ag dul abhaile faoi leis na praghasanna cearta chun órdú a cur isteach don scoil. Níor theastaigh uaim ach sibh a cur ar an eolas roimh ré. Táimíd go léir ag súil go mór leis an lá mór! Just a very quick note about afew small things. The 2nd class '14 First Holy Communion will take place on Saturday 24th May at 11.00 am. The 2nd class children will need to be at the church for 10.30 at the latest to rehearse and go through the various elements. 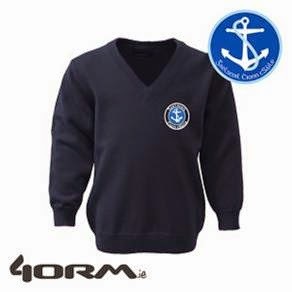 As you all know the boys will wear their uniforms for the ceremony with the addition of a blazer with the school crest. 4orm in Carrigaline can embroider this crest on for €5. It takes afew days/up to a week to do this. If any of you have difficulty collecting the blazer a parent who works close to 4orm has kindly offered to collect the blazers for people. A big thank you to her! Phone Hilda and she will put you in contact with the parent if you need to. As with other years you will all need to buy the booklets for the First Communion mass. They will cost around €4 for one, €7 for two. There is a charge as we have to have the printed professionally. A note confirming the price will go home this week and you can put in the amount you would like to order. I just wanted to give you prior notice. We're all looking forward to another great occasion! 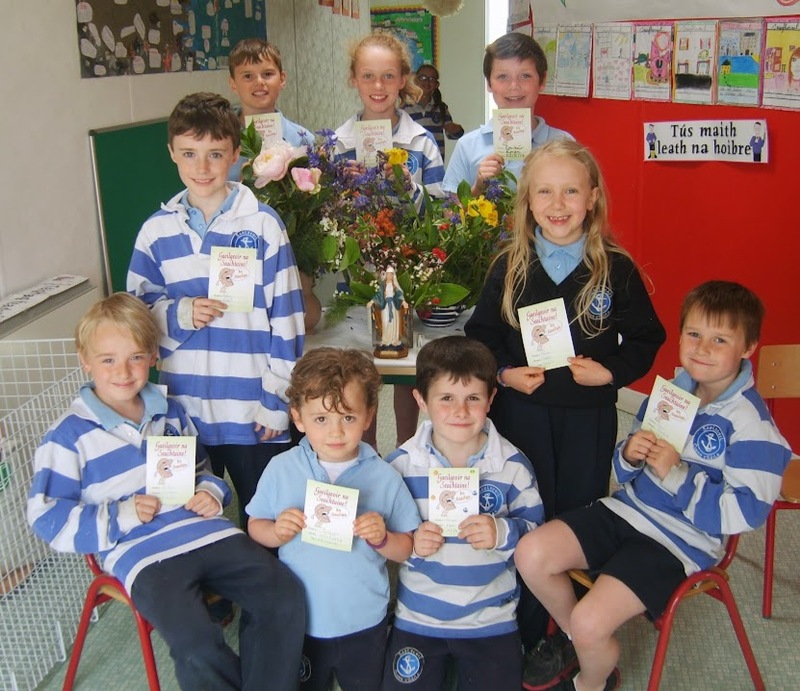 Fé mar is eol daoibh tá an Chéad Comaoineach le bheith ar siúl Dé Sathairn an 24ú Bealtaine '14. Tá go leoir leoir le déanamh ag na páistí, múinteoirí, Coiste na dTuistí agus tuismitheoirí deonacha chun lá an-speisialta a chruthú dos na páistí. Tá sé de nós againn sa scoil go dtagann tuismitheoirí Rang 1 le chéile chun gach rud a eagrú agus a stúiriú mar gur bhur bpáistí a bheidh ag lorg seo an bhliain seo chugainn (Bealtaine '15). Lorg Coiste ne dTuistí roinnt deontraithe chun cabhrú ach níor tháinig mórán/ go leoir ainmneacha isteach go fóill pé scéal é mar sin táim ag impí ar dhaoine teacht chun cabhrú chun lá an -speisialta a dhéanamh den ócáid álainn seo! Tá an liosa in oifig Hilda mar sin téir chuichi nó scríobh ríomhphoist chuichi agus déanfaidh sí d'ainm a cur ar an liosta. As you are all aware 2nd class' First Holy Communion is set to take place on Saturday the 24th May '14. Lots and lots of effort and work culminates in this very special occasion, by the children and teachers but also by the PA and volunteer parents. It is customary for the 1st class parents to organise and host the party that's up in the school after the ceremony. The favour will be returned next year when your children will make their First Communion in May '15 and so on. The PA sent a request for volunteers last week but unfortunately at the moment there aren't enough names on the list to host the party. So I am appealing for more volunteers to help on the day to make this the special occasion the children deserve - be it baking beforehand, setting up on the morning, serving teas etc on the day and the clean up after. We really need as much help as possible. It's a fab day but it relies on goodwill so please come forward. The more the merrier and no help is too small! The list is in Hilda's office so you can pop into her or else drop her a line and she'll add your name to the list. Dea scéal! 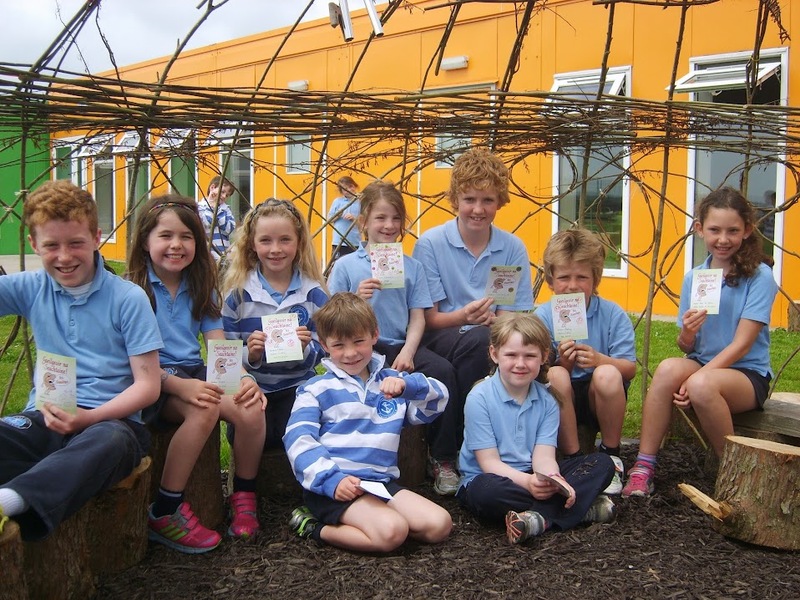 Tá na turasanna scoile eagraithe againn don Mháirt an 10ú Mheitheamh 2014. Beidh na ranganna ar fad ag dul ar an dáta céanna. Táimid ag súil go mór leis an lá agus beidh litir ag dul abhaile níos cóngaraí don dáta faoi amannta na mbusanna agus cad a bheidh ag teastáil ó na páistí dos na turasanna éagsúla chomh maith. Good news! We have organised the school tours for Tuesday 10th June 2014. We are really looking forward to the day and there will be a letter sent closer to the date about times of the buses and what the children will need for the various trips. Tá altór á chur le chéile againn chun Mí le Muire a cheiliúradh. Ta fáilte roimh na bpáistí bláthanna a thabhairt isteach agus cur leis an mbord. We are putting together a May Altar to celebratethe the month of Our Lady. The children are welcome to bring in flowers to add to it. Bhíos ag caint le 4ORM inniú 07.05.2014 agus níl aon fhadhb leis an suathantas a cur ar bléasar ar €5. Ní thógann sé rófhada ach an oiread. Beidh gach páiste sa rang ag fáilt cárta ó gach phaiste eile sa rang mar sin níl aon gá le cártaí aonair a sheoladh isteach in aon chorr. Má roghnaíonn sibh cártaí breise a sheoladh isteach ní scaipfear iad ach amhain má tá ceann ann do gach phaiste atá ag glacadh leis an gCéad Comaoineach. Táim cinnte go dtuigeann sibh go léir na cúiseanna leis an gcinne seo. I was talking to 4ORM today, 07.05.2014 and there is no problem with putting the crest on the blazer for €5. It doesn't take too long either. Every child in the class will be getting a card from every other child in the class so there is no need to send individual cards at all. If you choose other cards to send in they won't be handed out unless there is one for every child that is getting First Holy Communion. I am sure you all understand the reasons for this decision. Fé mar is eol daoibh tá an Chéad Comaoineach ag druidim chugainn ar luas lasrach! Lá an-speisialta atá i gceist ann agus baineann gach éinne an-taitneamh as idir phaistí, tuismitheoirí agus múinteoirí. Táimid an-bhuíoch as Coiste na dTuismitheoirí agus na tuistí uile ata ag cabhrú. Táimid ag lorg cabhar ón gcóir scoile leis an amhránaíocht. Tuigim gur Sathairn atá i gceist agus go mbíonn daoine gnóthach ach bheimís fíor-bhuíoch dá bhféadfadh éinne sa chór gur féidir leo, a bheith ann. Tá nóta beag i málaí scoile na bpáistí sa chór le rá an mbeidh siad in ann freastal air. Seol é sin isteach roimh an Aoine le bhur dtola. We are looking for help from the school choir with the singing. I understand that it's a Saturday and people are busy but we would be really grateful if everyone in the choir would come if they can. There will be examples of both "Mounted and Framed" photographs on display on the day ! For anybody who would like to have their photo's taken before Mass, I can setup in the school beforehand if people have early dinner appointments, I just need to know who's coming and the time ! Also, if a timetable with a list of names could be made out it would save confusion. each family will be 10-15 minutes ! A minimum deposit of €20 is required. In keeping with tradition, this year's Rang 1 parents will host a party in the school for all of the First Holy Communion children and their families as well as the school choir. Everyone is welcome to come back to the school straight after the mass for a cup of tea/coffee, sandwich, cake. Family, relations and friends are more than welcome, however we do kindly ask you to be mindful of the amount of people you bring back to the school e.g. 6/7 adults extra per family is fine.. 10/12 might be a bit excessive.. the more the merrier on the kids. Huge thanks to Trish and Caroline for organising. The last "Do this in Memory of me mass" will be held after the Communion on Sunday 22nd June 2014 on the Feast of Corpus Christi at the 12 noon mass. All of the Holy Communion children of the Parish will be invited to walk together in the procession after the mass. If you have any questions at all please give us a call. Bhí an dáta mícheart agam don bhlitz iománaíochta atá ag teacht suas. Beidh sé ar siúl ar an Máirt, an 13/05/14, ní an 6/05/14 mar a cheap mé. Mar sin ní chaitheadh na páistí atá ar an bhfoireann a bheith réidh don bhlitz ar an Máirt. Beidh níos mó ama againn anois chun smaoineamh ar an bhfoireann chomh maith. I had the incorrect date for the hurling blitz, its actually on the 13/05/14, not the 6/5/14 as I told the hurling team. Therefore there is no need for those pupils to bring in their gear on Tuesday. Also, the extra week will allow us to reflect further upon the selection of the players for the team, as unfortunately, places are limited. More information will be made available next week.